Brenner 1977: A study of the efficacy of the Feingold diet on hyperkinetic children. Some favorable personal observations. Results of 32 children on the Feingold diet. When 32 hyperactive children Dr. Brenner had been treating medically for years were given the Feingold diet, 11 of them — 34.3% — “markedly improved.“ Another 2 improved as much but were older, and at that time it was thought that ADHD may spontaneously go away at puberty. 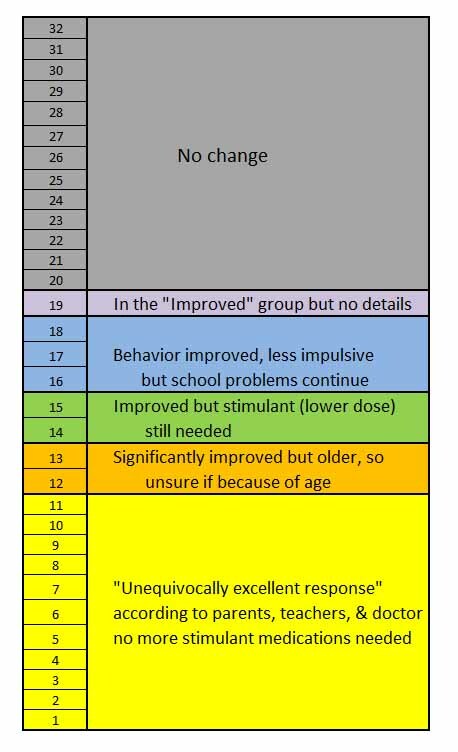 Because of this uncertainly, they were placed in the “probably improved” category along with 2 others who had improved but continued to need medications, 3 others who had partially improved, and one more in that group without details. Thus a total of 19 of the children — 59.4% — of the children improved on the diet. NOTE: This was before the removal of the preservatives BHA, BHT, or TBHQ were part of the diet protocol. It is about the same percentage (30-50%) as Dr. Feingold had reported in his clinical trials; this changed to over 70% once the preservatives were removed as well.